Pharmaceuticals, fine art and forensic evidence could be secured along their supply chains by a new identity and authentication prototype, incorporating NFC chips and blockchain registration and verification, unveiled by US blockchain and internet of things firm Chronicled. Each CryptoSeal is a slim, adhesive seal strip, containing an NFC chip with a product’s unique identity information, which can be customised for size and fixed to any physical item. The identity data of the object, registrant and packaging or asset metadata is registered and verified on the Ethereum blockchain platform, “guaranteeing its identity and authenticity in an unforgeable way”, Chronicled says. 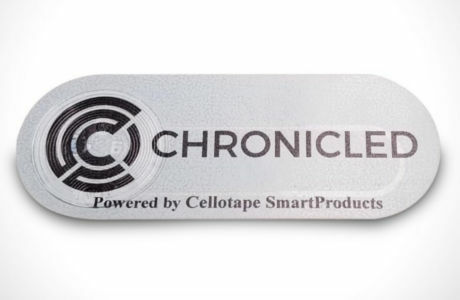 The solution, developed in collaboration with Cellotape Smart Products, will be the first in a line of “blockchain-registered and tamper-evident hardware products”, the company adds, which will “provide a secure chain of custody in the supply chain”. Chronicled CEO Ryan Orr compares the system to a medieval wax seal stamped by a signet ring wearer. “The signet holder is analogous to the registrant of the CryptoSeal, the wax to the chip inside of the seal, and the stamping of the signet is like the signing of the CryptoSeal to the blockchain,” he says. CryptoSeals will begin entering the market later this year, Chronicled adds, with standard and unique offers, including customisable sizing and adhesives. Earlier this month, fashion brand Babyghost announced it had partnered with Chinese blockchain-as-a-service company BitSE and its VeChain project to deliver a range of clothes incorporating NFC tags and verified using blockchain technology.